Do you work for Jenkins? "The Standard for On-Premise CI Servers"
Jenkins is the standard in continuous integration servers that are deployed on premise because it was one of the first products available in this space and it has continued to innovate. Jenkins can integrate with almost any external system used for developing applications which means that you worry less about your tooling and more about delivering good code. More recent tools that are cloud-based like CircleCI, TravisCI and CodeShip provide similar features but do not have the comprehensive plugin integration that Jenkins still has. Anyone using Jenkins also benefits from years of other developers using the product and solving problems meaning that it is rare that you will run into an issue with this tool that hasn't already been solved. Jenkins is still heavily plug-in based to add functionality to the base system. Upgrading and maintaining plugins to get desired functionality can sometimes be frustrating and time consuming. Upgrading some plugins can sometimes break the functionality of other plugins leading to breaking jobs that were previously working. This is less prevalent than it used to be but anyone managing a Jenkins instance must be cautious about upgrading plugins and breaking user jobs. That being said, you will not find a greater breadth of plugin variety in any other tool on the market. Jenkins can connect to almost anything which makes integrating with your system of choice a much easier task. If you require an on-premise (inside the firewall) CI system then Jenkins will be easy to setup and start using in a very short period of time. You can always find help online solving any Jenkins issues you come across so you feel supported and that you won't have to spend time troubleshooting your CI install. If you are open to using cloud tools and you have a simple build then it is worth considering other options because Jenkins is not offered as a cloud service. I use Jenkins to provide continuous integration of application code and often use it for continuous deployment as well. Jenkins can watch source code repositories for changes and immediately pull that code and send it through a battery of steps designed to ensure that no problems were introduced into the code when it is integrated with other developer's code. Jenkins can execute any step you can program but common steps include unit testing, integration testing, source code analysis, dependency vulnerability scanning and end-to-end testing. Jenkins is one of the best Continous development tools in the market. It can automatically run test jobs whenever you push your code to a repository. Hence easily, issues can be identified and even the code can run for dependency errors on a remote machine. provides accurate build logs for a particular job with regular success/failure email notifications to concerned users. Jenkins can integrate with almost any external system used for developing applications which means that you worry less about your tooling and more about delivering good code. I haven't come across anything which I don't like about jenkins. However, UI can be improved a bit. I use Jenkins to provide continuous integration of application code and often use it for continuous deployment as well. Jenkins can watch source code repositories for changes and immediately pull that code and send it through a battery of steps designed to ensure that no problems were introduced into the code when it is integrated with other developer's code. "The best CD tool out there "
How incredibly useful Jenkins can be. No better tool exists for integrating your repositories and code bases with your deployment infrastructure. It can automatically run test jobs and create artifacts whenever you push your code to a repository. If those checks fail, it will notify you to come and fix the issue. On top of this, there are a ton of plugins and other customizable settings that allow you to make jenkins jobs for almost any application or deployment- small or large. The UI is a little ugly. While the application is still incredibly useful, the GUI could use some touching up here and there to make it more appealing to look at and navigate. A lot of the progress features and icons are super pixellated and don't refresh automatically when jobs finish. This is a very small, somewhat insignificant issue and does show how great jenkins is as a tool. It is also a free application so it is understandable that they wouldn't be able to apply the same polish as a licensed app. learn it well and it will become your most valuable tool. Solving our deployment issues. Since we are employing a devops infrastructure, we have committed to consistently deploying our applications weekly if not more. This means we don't have the time to sit down and manually deploy our code and check that it passes our tests each time it is updated. By automating that entire process with jenkins, a 3-man team can now support 5+ apps compared to before where they would be supporting only 1-2. 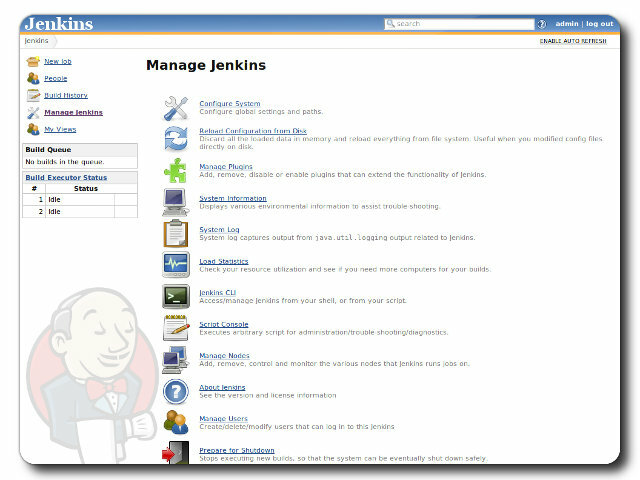 "Jenkins - Continuously Providing Integrated Solutions"
Jenkins provides easy to use interface when it comes to configuring almost anything with respect to Jobs, Admin configurations, Plugins. Although, Jenkins provide many out of the box functionality, it also has wide variety of plugins to support continuous integration best practices. Jenkins can be integrated with different source control management tools, build automation tools, code quality tools. Jenkins can generate the test reports in xml format which can be emailed to developers on every job execution. Jenkins also provides file fingerprinting option which is helpful when there are multiple dependencies among different projects in Jenkins. Jenkins provides accurate build logs for a particular job with regular success/failure email notifications to concerned users. I have not come across anything which I dislike about Jenkins. I would recommend Jenkins as the most easily configurable and easily managed tool for on-boarding applications for continuous integration and continuous delivery. Moreover, it has got features which are helpful even for a naive user to get started and perform activities such as integrating the source code management tool, build automation tool, code quality tool, deployment scripts, servers to which the applications are to be deployed to and other available options and plugins. I have integrated different DevOps tools with Jenkins and formed many end to end release pipelines. After using Jenkins, the build and deployment time has significantly reduced which in turn has reduced the effort for performing manual releases every time. "Great community support, many additionally plugins, very easy to learn and use"
The worst thing about Jenkins (and this isn't exclusive to Jenkins), is that the support for containerization just isnt there yet. Not to say it doesn't exist, but it's not very mature and it's almost like putting a square peg in a round hole. In many environments Jenkins is becoming moot because of this. Think about how you want to set up your builds before you jump right in. We created a pretty cruddy pipeline in the beginning and as a result our deployments took 15x as long as they should have. Also, if you are thinking of building a plugin, it would be nice to have vendor specific plugins that address specific issues related to those platforms (such as liferay, hybris, etc). The community behind Jenkins is amazing. I've used and managed Jenkins (and Hudson) exhaustively for years and have never been the first come up with a great tool idea or workflow. I think the UI is still lacking. I like to use my mobile device when needed. The "Blue Ocean" is a step in the right direction but doesn't seem ready for prime-time yet. Jenkins should be the first step of any development project. It's affordable and easy to setup. There is a 90% chance that your workflow has already been used in production by someone in the community, and they have documented it with easy to follow examples. Use the "jenkinsfile" approach if you can! It is part of our continuous automated testing and deployment workflow. We have hooks in place to move artifacts through multiple gates and multiple environments. We also use it for automated integration testing of multiple environments, triggered periodically, in addition to the build/deployment pipelines. We are working with jenkins in all environment (Dev, QA, Stage and production) and the integration of Jenkins and third party plugins (Git, Mesos, Maven, artifactory) works great for all the workflow from Dev to prod, RBAC for access control works great with AD integration and the setup of new jobs/pipelines is very easy. with some upgrades the third party plugins just broke and we need to do some workarounds until the plugin got updates, so, keep in mind you need testing deeply before upgrades and try to always use a LTS version. Jenkins will be your best option thanks to all plugins available, but be very careful with upgrades or your third party plugins could fail, try to work with LTS version and install just the minimal plugins you could need. "Most powerful and versatile Continuous Integration tool in the Market"
Jenkins the most useful tool for integrating source code repositories with organizations infrastructure to enable seemless automated build delivery into any environment. "Great, free continuous integration tool"
I love that the product is free and has so much customization via user created plugins. The slave node default workspace cannot be configured per slave node. Look at the available plugins to see how many different use cases you can achieve. It provides cost savings and can provide multiple uses. Jenkins allows us to sync up with Jira and Bitbucket so we can have builds triggered automatically. We have the ability to speed up building by having parts of the build run concurrently. We even use it to run some metrics tools and run unit tests to generate reports. It allows us to integrate changes among different teams by providing builds faster by having the pre-configured. "Best software for Build Automations"
Kind of complex though! Like, it takes time to know whats the reason for error and work on it. Eventhough you get to know the error, it works one day but no the other day. Issues like, network issues,space issues, and even, the server of the tool you use might be over consuming.. and many other reasons which are not in our hands. Jenkins enables us to do Faster QA and deployment cycles. We have integrated Jenking with Regression to reduce QA efforts. "Easy to use, setup and configure"
With Jenkins Versions 2 and later, it has become really easy for us to setup and use Jenkins. There are plenty of plugins available which helps us automate most of the jobs we have as well. UI is simple and easy to learn. Jenkins is used to automate our daily build processes. Even though the UI is simple, we'd like a little more graphics. Some plugins are not compatible with the latest version, and most plugins get abandoned after a while. I would highly recommend Jenkins to anyone trying to automate certain manual processes. It has helped us solve a lot of issues we have had with our current manual build processes. Also it's visual representation of the status and current progress of builds help us in monitoring and troubleshooting tasks. It is also easy to setup and configure, and lets you get started within less than an hour. Some external plugins available are not compatible with the latest version and some are no longer supported, so I'd advise anyone using to be careful when using plugins, make sure you use plugins that will be supported on long term. We're excited to see what Jenkins blue ocean UI plugin has to offer us. For now it is still in beta version, and hopefully it will replace the current UI with a more modern look and feel. We have a build process that uses CMD files and they're triggered within cmds itself, but with Jenkins, we can easily schedule these scripts as well as get a visual representation of the status and the progress of the build. "Most flexible CI/CD system ever"
The very best thing I like about Jenkins is it's flexibility. I mean, you can do anything with Jenkins (as long as there is a plugin). There is a learning curve of course but after you've mastered it the sky is the limit. Another thing I like about Jenkins is how easy it is to setup. With Jenkins 2.0 you're good to go in about 5 mins. What is dislike about Jenkins is, it's user interface. You can clearly tell that there is a lack of love there (even after the work that was done with Jenkins 2.0). Another thing that needs improvement is more native support for containers and also for Pipeline as Code. Getting productive while using Jenkins might take some time. Be patient. You will get there. Also keep in mind that despite the issues you will be able to do pretty much anything you want. I've used Jenkins mainly for doing Continuous Integration and Build Automation. Customizable cofigurations with a ton of plugin. Easy use for every developer in a short time. Good user management makes things secure and unbreakable. There is only one plugin for every aspect and this may be negative sometimes. Because you need one little more thing to have but plugin doesn't provide. And that plugin is not customizable even with code. We transformed all our projects to Jenkins to automate build and delivery processes company-wide. It became a standard to develop projects and maintain their continuity. "After you learn about benefits, you create a new world of automation"
In resume, you may automate the build of your software, and deliver in development, QA and production environments, all monitored and with logging/audit of who is running what job, and when was executed. The time you need to learn to use, if you're trying to use it alone. If you learn from someone that already use it, it's really fast to learn. If you already use a tool like this, maybe this tool is not for you. But, if you don't have any tool to automate stuff, give it a try, because you only need a server to start, as the software is opensource. It will already help you with lots of stuff. From simple Windows scripts, to more complex, like build and deploy to Kubernetes, in different environments, with aproval of different users, alerting in a slack or another tool, all this Jenkins will help you to solve. It may be manually started, event driven, or another way you choose to use it. The setup, as it is a orchestrator, is fast and requires to know the other servers more than Jenkins server, like credentials, paths, executables, source and destination and what you need to execute there. Have fun with Jenkins! Simple and Quick Installation / Setup and Configuration. Light weight. Can be deployed on a simple light weight server like Tomcat. Small memory foot print. Able to run in a Master Slave configuration executing the Jobs in the Slave Nodes orchestrated by the Master. Tons of plugins available to integrate with the other tools and products. Best in class product. Creating multiple jobs is laborious and time consuming. Duplication of the configuration in the jobs results in a major rework if anything has to be changed across the board. Difficulty in running huge build with 1000s of test cases and Hundreds of thousand lines of code which can generate tons of logs during the build which may result in a Jenkins server crash. The software is highly open source and has a rich community that generate plugins. Since version 2.x pipeline has code is truly a game changer. Since the community is generating a lot of plugin, quality of these plugins is variable. There is a lot of automation tool and solution, Jenkins is a great and free. Jenkins let us automating a lot of the software build pipeline. And provide a great platform to expose the results. "Easy enough to use you'll wonder why the won't let you"
As a Front End Developer, I love that Jenkins makes it easy to deploy changes, you can see which environments you are using. I also loved that you customize what files are being deployed etc. It's a great open source tool, that is fairly easy to set up. It would be worth it to offload some of the efforts of maintenance or setup though, as after a while it eats into the easiness of it. Continuous integration issues, it's very frustrating to just need to have a small fix, but be unable to navigate it's deployment to production individually. Especially when dealing with smaller projects. How widely adopted it is in the industry which means lots of supported technologies is one of the biggest things to me. The ease of use and the pipeline features are invaluable to us. The interface could be better. Browsing from the top-level down can be a little cumbersome - especially in the Enterprise version spread across many master servers. Also, some of the context menus and switching could be improved. As far as overall functionality however, there isn't much I dislike. Start small. Utilize VMs as much as possible for the server and slaves both. Make sure you utilize pipeline groovy scripts from the beginning and avoid using unapproved CloudBees plugins even if you are still using the open source version. Also, using Jenkinsfiles along with the github integration makes things so much easier when adopting. We are using it for our software builds. We use it for continuous integration and delivery of hundreds of software systems with hundreds, if not approaching 1000s, of software components worldwide. "Awsome CI and CD tool"
Jenkins is an awesome Continuous integration and Continuous deployment tool, You can deploy your code on any cloud system from any source code repositories.Its biggest advantage is its plugin architecture. You can install plugins as per your need. you can use its scaling mode to run multiple deployment at the same time. Administrating Jenkins can be a hectic task for newbie. Its documentation is good but still it is hard to figure out which feature and function to enable and which to disable. Sometime plugin functions can conflict with each other. Instead of manually deploying code, use jenkins to automate your task and save resources and efforts. We are using jenkins to deploy code on our development and production servers. I like the way that jenkins integrates with a lot of external systems. we also like It is a server-based system running in a servlet container like the Apache Tomcat. It offers support for SCM platforms and solutions like AccuRev, CVS, Subversion, Git, Mercurial, Perforce, Clearcase and RTC, and can implement Apache Ant and Apache Maven-based projects. Jenkins can also execute arbitrary shell scripts and Windows batch commands. I do not like how it is configurable, seems to be about 20 years out of date. I would recommend Jenkins to anyone who is looking for a continuous integration tool that delivers continuous integration services for software development. We use jenkins as a continuous integration tool that delivers continuous integration services for software development. "Ok but the UI is pretty bad and the scheduling facility is awful." First off, I need to qualify my review by saying that I don't have much experience with other build tools and I'm a fairly novice Jenkins users. Jenkins has ALOT of in-built functionality, almost to a fault (see dislikes). First off, we're on version 1.6 and the UI leaves alot to be desired. Also, the tool is not particularly user friendly and, as other reviewers have mentioned, some functions (like job configuration) are overly complicated and cumbersome. One of my biggest gripes is the lousy, antiquated job scheduling using CRON. Really? That's technology from the 1970s. In fact, the scheduling is so bad that I end up using the options to kick-off builds from the command line and then use Windows Task Manager. I guess the old adage applies: you get what you pay for and this open source tool is no exception. Maybe some of the UI drawbacks have been fixed in the latest version. At the very least, make sure you try out the scheduling facility if that is important to you and make sure to look at the job configuration page. We needed a tool to facilitate Continuous Integration. I wasn't involved in the tool selection process and somehow we ended-up with Jenkins. Personally, I would have kept looking for a tool with a richer, more user-friendly interface and a real scheduling facility. "Perfect UI for Automation Frameworks"
We all know this project for it's superb CI/CD abilities and malleable scripting interfaces. I am sure many have found many other uses for Jenkins. Personally I have found it to be an incredibly quick to market, secure and performant user interface for launching automated tests. With fantastic plugins that provide instant traceability, login management and statistics, Jenkins provides a robust platform for wiring up the latest test frameworks. There's not much to dislike about Jenkins. The open source community is very supportive. That can make upgrading and patching a little hectic. The look and feel is aging a bit. Race conditions are also difficult to manage from one OS to another. There are some great CI/CD products out there but if you're looking to get up and running quickly with the latest standards and great community support, why would you not use Jenkins? Automation Framework UI and Internal Tools Launchpad. The benefits have been ease of use, good traceability, and instant credibility with the developer community. "Easy enough to get going without running into too many problems, not flexible enough for all situati"
It is very easy to get it installed and start testing various build options. I like being able to use slave instances...gives you the opportunity to build a robust build farm. I like how easy it is to send build information to interested parties. Even though there are hundreds of plug-ins, it still surprises me how often I have to write something that will fit a unique situation. It uses up a ton of memory, and after a few CI runs, more and more. Some Jenkins releases are better than others, so if one is not too bad, I'm very reluctant to upgrade to a new one. I don't like that I can't narrow down CI builds to each individual change. That's a pain. It is worth the cost. : ) Truly, though, it is worth the cost of the time to set up and test to see if it meets your needs. Needed to get builds running fast. Installing on Windows is very easy; installing on Linux is pretty easy. It's easy to hook up with existing CI tools by using slave instances. It's great to do build automation because it lets me create builds in my sleep. Continuous integration saves a lot of time and resources because it lets us know if there is a problem with the build right away, rather than having to wait for the automated (nightly) build or, egad, when QA gets it. Jenkins free, open source (released under the MIT license), is easy to configure, easy to use, and feature rich. I have (on very rare occasion) experienced bugs that disappeared after restarting the server. I've not investigated those very thoroughly because they are so rare. Every software development project should utilize continuous integration, automated builds, automated test, and automated code quality metrics. Jenkins is an excellent choice and should be high on your list of candidate tools. Continuous integration and automated builds and tests from assets in Github; automated analyses such as static code quality, test coverage, etc. "Good for continuous deployment for small companies"
It is easy to break tasks into many jobs and chain them together. There are also many plugins for many platforms and if one is not available, you can always script them. It is also easy to integrate with many notification methods like email or webhooks for slack. It is open source and so there are times when plugins have issues and they need to be fixed by others or you need to suggest a work around. The UI is not very attractive. Jenkins build uses servers and if the servers are less, load is more, and the build may take a long time to complete. Don't forget to take the leap. Using it for building code and deployment. Automatically creates a build and posts to company managed Jenkins page. "Jenkins - An open Source awesome tool"
1. Its web -based UI makes it platform independent. you can access it from anywhere . FRom your phone , laptop , just anything . It is usually a big problem with many softwares. 2. It comes with a wide variety of plugins . there are plugins to do anything and everything. For any need of yours just download a required plugin and you are good to go. No need to fiddle with code for doing trivial things . It saves lot of your development time . 3. It comes with a lot of security features. Making user management very easy. It has all different kinds of options for user management and Access Control . Very nicely made , this is a very good piece of software . 4. It has a very large community which supports it . I dont like its UI that much . There is a need to improve it . Although , it serves the purpose very well . GO for it !! Its amazing . I run a company which requires a large number of softwares to run and those softwares keep on updating frequently. It a pain to do their deployment manually every time. Also , there are chances of human error to happen . So, I use Jenkins here. I have automated the whole process and now it all happens automatically every time code is pushed to the repo. It also generates reports for itself. "Good CI tool, lots of plugins for enhancement"
Jenkins is pretty easy and straightforward to install and get setup. There are also lots of plugins that you can use to enhance your experience. I've used the git, gitlab and svn plugins. I also like that the interface is simple and easy to navigate. I also like the email notifications. Overall, I don't have any major complaints. For multi-module or larger projects, sometimes the build can get out of order. Maybe this is due to human error - but one build kicks off another ...one fails .. but then you have to wait for other builds to catch up before you have a successful build. You have multiple developers committing code and you need to continuously integrate that code and determine if there are any bugs or errors in the build. It is better to catch these problems sooner than later. "We use Jenkins heavily, for builds, deployments, and datacenter management." I like that it is open, free, and has many plugins, which are also free. The interface is clunky, and sometimes difficult to use. It is especially difficult to manage the output consoles when there are many of them. The auto refresh is not modern and requires a page refresh, instead of any local dynamic updates. Jenkins is an excellent free, lightweight script execution platform. Builds, tests, CI, and many other functions are native to Jenkins and can be performed no better with any other software. For highly dynamic content, persistent jobs, etc, I would recommend seeking another solution. We perform everything from maven, gradle, chocolatey, rpm, and custom puppet package builds, to large-scale whole product deployments to multiple datacenters in minutes; other uses include jobs to detect load and respond with resource increase or decrease. Finally, we output data to graphs, pulled and built by Jenkins, on Confluence wiki for weekly metrics and performance review. "Control Automation Testing via Jenkins"
This alleviates users having to do things via the command line, and for non-technical users that can sometimes be cumbersome. Along with the Jenkins plug-in for Cucumber Reports, it produces a nice pretty HTML report of the test run where you can look at passing/failing tests and drill down into any single test to analyze the log, etc. You can also add the Slack plug-in to get the HTML report sent out via slack (or email, etc.). Jenkins, for the most part, is easy to configure, but some of the help pages for Jenkins do not give the best examples on how to set things up from scratch. Novice users may encounter a few challenges on setup. Open source software, good stuff! Running automated test suites via the click of a button. There are configurations for everything in Jenkins. Every time you need a new build for a new git repo, you can set it to the default and let it run its course, or you can configure every small detail and step to do everything you want. Do you need it to do something after the build is complete, just set it it to run a script after its done, and you are good to go. Everything in Jenkins is configurable and that is its strongest suit. The positive with Jenkins is also a negative in that everything is configurable. In a way, its great, but at the same time, when something goes wrong, you have to look at the configs and read every line since issues are not always logical and easy to find. Tenacity and Jenkins are both very similar in design and in quality. You cannot really go wrong with either one and you will not be disappointed either way as well. We have a large amount of git repositories that are constantly being changed. We use Jenkins to ensure that each git repository is fully working and is buildable. We then use it to upload the results to Nexus automatically so we have production and QA versions of our code in jar form. "Automate your Code Deployements With Jenkins"
Jenkins is the most used CI and CD tool. You can save a lot of time and effort which is being consumed in deploying in code on various servers for various stages. Jenkins can work based on Git Webhook, Hence user will just push the code to your git repository and Jenkins will take care of rest. You can use freestyle project for beginner level and then move to Jenkins pipeline for an advanced application. Nothing major cons experience with Jenkins ever, It just takes huge amount of memory while deploying application. "Automating Android builds with Jenkins"
Jenkins is open source and totally free (for commercial use as well) and it is a good reason to use it. It is a popular software with large community so we don't need to worry about support. Many teams begin their Continuous Integration with Jenkins and after a while move to another (paid) build system. I don't like user experience of Jenkins. It doesn't follow latest design trends, but it's not awful at all. Other build systems like TeamCity or Travis are much nicer and intuitive. Jenkins unlike other build systems is not hosted and we need to install it on our own machines (however, it might become an advantage as well). You should take Jenkins into consideration as it costs nothing (omitting the time needed to learn it). Other build systems are generally expensive for commercial use, but often worth paying for nicer UX, intuitiveness and better analysis. I use Jenkins for Android builds automation followed by Continuous Delivery. Jenkins meets all my needs. We can find plugins for git, gradle and android without the need to write redundant scripts. Moreover, there is a cool Build Monitor plugin that looks really nice when we launch it on external monitor visible to all team members. "Free, mature and easy to configure"
no costs for installing it. Used in every project that I was involved in within my past 5 years of experience. Has a lot of features and easy customisable. Provides reports, graphical representation of current status of running jobs, keeps history of and logs. Has a possibility to configure access rights for users. It could be much more comfortable. I've also tried Atlassian Bamboo which had more advanced features. But because it was years ago I can't recall all benefits of it and would not be able to compare them. 1) Feature branch build which are triggered on each push to git repo. 2) Nightly builds that are triggered for master/develop branch. 3) As automatic unit tests and integration tests runner. Getting a report about failing tests. 4) We empowered CI server to do daily deployment on DEV server and manually triggering to deploy on QA, TEST and PROD servers. 5) There are also some work is done to do automatic load testing, but I haven't go deep into it. 6) One CI server is used to manage multiple projects. Having all these, the main points are that we have eased deployment process, automatic tests. "Excellent product - easy to learn & configure!" There was no learning curve with Jenkins. I've had some experience setting it up, and I've been using it as a developer for years, and it never takes long to figure out how to do something. Creating new builds is easy; Deploying existing builds is as easy as one click; and perhaps most importantly, debugging builds is easy. Whenever a build is broken, it's just a matter of reading the logs or running the build config script inside my local environment. Sometimes I may need to log into Jenkins to see if there's something wrong with the Jenkins host, but that is rarely the case. The web-based user interface feels kind of dated at times, but works fine. It would be nice if there were fewer fields for the default use cases, because it can be bothersome to sift through all the fields to find common variables like Ruby version and destination host name. Would definitely recommend to any large team that needs continuous integration. Jenkins helps us integrate our code in the form of various builds that we keep running at any given time. it also provides hook-ins to Slack and other chat programs so we can be notified of changes to a build. I like the Jenkins ecosystem. It has basically plugins for everything, any service can be integrated with Jenkins. Writing new plugins is pretty straightforward as well. Also it is great that we can self-host the Jenkins instance, and install it pretty easily. The slaves are also very easy to add, so one can scale the CI as the resources allow it. The product seems like it stuck in the mid 2000s, the GUI is totally outdated. Configuring the job in the UI sometimes can be tedious, a text-based configuration file can be more help. There is an initiative to support this, with the Jenkins Pipeline plugin. I would recommend Jenkins, because all the CI problems can be solved with it, and the new Jenkins 2.0 version will be even better. We use Jenkins for pretty much everything. We build and test every merge request in the company, so the code reviewer can immediately see the compilation/static analysis/test results etc. We also use it for continuous delivery, as we deploy user test releases with Jenkins, sometimes manually, sometimes in nightly builds. "Jenkins has many false starts issues." Supports Java builds with maven and ant, bash shell scripting, remote login where Java agents execute. Initiates false starts so you have write rules to handle these use cases. Plug-ins don't always work with core version your using. May required to upgrade core, which corrupts your own written plug-ins installed. Linux LDAP/NIS support is lacking. Build restarting on false starts is not possible, without additional scripting. Plug-ins are weak in this functionality. Replacement for Build Forge due to management thinks free is less costly after you have already purchased the licenses and then dropped all support. "CI and CD both using a single tool"
Jenkins is the most used Continuous Integration and Continuous Deployment Tool. You can save a lot time and effort by automating your code deployment processed. It is much more helpful in case you have a large application that needs to be deployed on multiple servers. Jenkins makes sure that your application always stays in a consistent state. Its latest plugin Blue Ocean provide a more interactive user interface to make it more interesting. I have never experienced any major cons with Jenkins,It is super Awsome. we automate our code deployment using jenkins. "Jenkins, the easiest way to start with automation workflows and continuous integration"
Jenkins provides out of the box a complete Continuous Integration system that allows you to automate your development processes within a few minutes. Using it's plugin system, there's basically nothing you cannot automate. When a single instance is not sufficient anymore, Jenkins is easily scalable and fast processing your workflows in parallel. Jenkins offers a great dashboard to manage and display your running processes and even provides additional plugins to have key performance indicators (KPI) displayed on full screen in the offices so there's always transparency with the development teams. Jenkins integrates with the majority of commincation tools, we have for example it integrated into our emails, Slack, IRC channels, SMS Service and Time Tracker so that developers don't have to worry they miss an important update or failure notification. Sometimes you receive failed process stack traces that doesn't show clearly if the failure occured because something failed in Jenkins or in your application workflow. Because Jenkins needs to be installed on-premise and is Java based there's a requirement to have a Java stack available just to run Jenkins. This can sometimes be an issue if you're not having a Java oriented operation as this adds additional support requirements. Jenkins offers a huge amount of functionality and it's easy to get lost in the overflow of options. My advise is to start small and automate pushing your local code onto production. Once you understand what it can do more, you can add more processes to this workflow and make them dependend of each other by building pipelines. Once you feel comfortable using Jenkins, you can unleash it's real power and add all testing and QA processes in the mix, have conditional database provisionings and automate provisioning of cloud VM's. Once you start automating your development workflows and move towards continuous deployment, you will see you're saving a lot of precious time that can be reinvested into your development. Jenkins is a Continuous Integration system that allows you to automate workflows beyond development so developers have more time to focus on what they do best: development. By implementing Jenkins and a test driven development policy, we have reduced the development overhead by 400% and with the automated processes after development we have our changes pushed to production with less failures and higher quality. I have used this tool in my project and it is a very simple and easy tool to schedule multiple jobs. It supports continuous integration of multiple jobs. Also this tool is easy to install. Lot of configuration is required on every page while configuration of jobs. Detailed logs should be published when build fails. It is a very simple and easy tool to schedule multiple jobs and continuous integration of these jobs. There are a lot of plugins to use which make our task easier. I have used this tool in my project to schedule multiple jobs and auto trigger the builds at a specific time on regular basis. I have used Jenkins in my Automation framework to create jobs and call python, batch file and ruby directly through terminal.